Texaco began kerosene sales in Hong Kong and China in 1913 and Caltex began operating in Hong Kong in 1937 with a diesel terminal. This was situated in Tsuen Wan with the road leading to the terminal being named Texaco Road. The oil terminal was later moved to Tsing Yi island and the land plot in Tsuen Wan was developed into apartments named. Riviera Gardens. Caltex operates over a dozen service stations in Hong Kong. Caltex began in 1936 as the California Texas Oil Company a joint venture between the Texas Company (later named Texaco) and Standard Oil of California (later named Chevron Corp.) to market oil from newly gained concessions in Saudi Arabia. It was renamed Caltex Petroleum Corp. in 1968. The two parent companies merged in 2001 to form ChevronTexaco (renamed Chevron in 2005) with Caltex remaining one of its major international brand names. 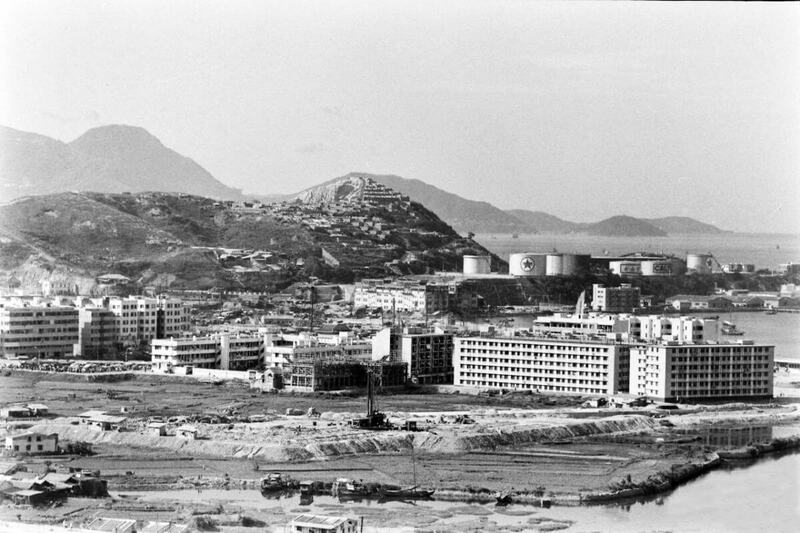 HF: This image shows the developing Tsuen Wan in the foreground, the Caltex oil storage depot in the background with a hill top cemetery above. This article was first posted on 28th May 2017 and updated on 19th June 2017.